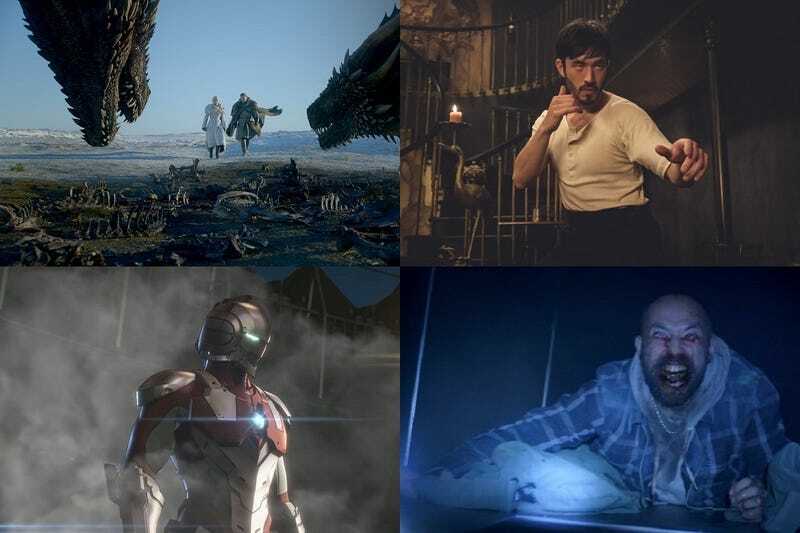 Clockwise from top left: Game Of Thrones, Warrior, Black Summer and Ultraman. This month we may finally discover who, if anyone, gets to sit on the Iron Throne, as the tale of Westeros starts it’s concluding season. The next thirty days also sees the return of the Legends, Sabrina, Tandy & Tyrone, The Tick and Wonkru. New series feature a martial arts prodigy in the 1800s, explorations of Ancient Egypt, zombies, a sinister heart transplant, Ultraman, and a sci-fi anthology reboot. There are also a bunch of early season finales, particularly in the latter half of the month. Scroll down to discover what will soon be popping up on a screen near you. A reboot of Rod Sterling’s anthology series. Set in San Francisco in the aftermath of the Civil War, the story follows a young martial arts prodigy, newly arrived from China under mysterious circumstances, who becomes a hatchet man for one of Chinatown’s most powerful tongs. Based on original material written by Bruce Lee. Gives viewers a rare opportunity to see the inner chambers of an excavation site, where archeologists recently uncovered a network of vertical shafts leading to an underground network of tunnels and tombs with 40 mummies believed to be part of the noble elite. Acclaimed Egyptologist Ramy Romany expertly guides viewers around the world as he investigates the spellbinding secrets of the most fascinating burial sites, mass graves and ancient tombs on Earth. A mother, torn from her daughter, who embarks upon a harrowing journey, stopping at nothing to find her. Thrust alongside a small group of American refugees, she must brave a hostile new world and make brutal decisions during the most deadly summer of a zombie apocalypse. Experts dive deep into the secrets of Ancient Egypt, and use cutting-edge archaeological technology to reveal the hidden truths that could potentially answer questions that have befuddled Egyptologists for generations. Beautiful Spanish princess Catherine of Aragon navigates the royal lineage of England with an eye on the throne. Dramatizes the story of the 1986 nuclear accident — one of the worst man-made catastrophes in history — and the sacrifices made to save Europe from unimaginable disaster. A brilliant antiquities expert and a cunning art thief team up to catch a ruthless terrorist who funds his attacks through stolen treasure. As they crisscross the globe hunting their target, they unexpectedly find themselves in the center of a 2,000-year-old battle for the cradle of civilization. Inspired by a true story about the origins of Ebola, a highly infectious virus from the central African rainforest and its arrival on US soil in 1989. Based on the best seller by Richard Preston. Characters reunite after a decade to celebrate South Dakota’s statehood. Former rivalries are reignited, alliances are tested and old wounds reopened as all are left to navigate the inevitable changes that modernity and time have wrought. It’s 2018, the Apocalypse is near and Final Judgment is set to descend upon humanity. The armies of Good and Evil are amassing, Atlantis is rising, and tempers are flaring. Everything appears to be going according to Divine Plan. Except a somewhat fussy angel and a fast-living demon are not actually looking forward to the coming war, and someone seems to have misplaced the Antichrist. Based on the Neil Gaiman novel. Centers on CDC researcher Abby Arcane, who returns to her childhood home of Houma, Louisiana, in order to investigate a deadly swamp-borne virus. While there, she develops a surprising bond with scientist Alec Holland — only to have him tragically taken from her. But as powerful forces descend on Houma, intent on exploiting the swamp’s mysterious properties for their own purposes, Abby will discover that the swamp holds mystical secrets, both horrifying and wondrous — and the potential love of her life may not be dead after all. Vic McQueen is a young, working-class artist who discovers she has a supernatural ability to track the seemingly immortal Charlie Manx. Manx feeds off the souls of children, then deposits what remains of them into Christmasland, a twisted Christmas Village of Manx’s imagination where every day is Christmas Day and unhappiness is against the law. Vic must strive to defeat Manx and rescue his victims – without losing her mind or falling victim to him herself. Based on the novel by Joe Hill. New entries marked with [NEW]. A reboot of Steven Spielberg’s sci-fi anthology series. A limited series based on the sequel to Caleb Carr’s ‘The Alienist’. Astronaut Niko Breckinridge is focused on searching for alien intelligence, leading a crew on a mission to explore the genesis of an alien artifact. As Niko and her young crew investigate, they face unimaginable danger on what might very well be a one-way mission. A secret student society in the heart of Amsterdam where best friends Rosa and Jacob surrender to a world of wealth and power. But slowly they start to realize they’ve entered a demonic place, built on secrets from The Netherlands’ past. A place where true power comes at a terrible price. This will be a live-action adaptation of the popular Nickelodeon animated series. Set in world people can manipulate the elements of Earth, Water, Fire, and Air, they lived peacefully in different regions until one started a world war. One master who can manipulate all four elements, dubbed the “Avatar,” had been able to prevent this war, but disappeared soon after. 100 years later, a new Avatar named Aang awakens and sets out on a journey to master all the elements in order to bring peace to the land once more. Centers on Emma Green, an American astronaut who must leave her husband and teenage daughter behind in order to command an international space crew embarking upon a treacherous, year-long mission. A Norwegian tongue-in-cheek horror anthology series, where each story is set in its own realistic, yet weird universe. Set in a world where superheroes embrace the darker side of their massive celebrity and fame. It revolves around a group of vigilantes known informally as “the boys,” who set out to take down corrupt superheroes with no more than blue-collar grit and a willingness to fight dirty. Based on the Garth Ennis comic. An English-language remake of a French series where each episode consists of a playback of an audio recording—an airplane black box, a voicemail, a 911 call—that depict some sort of tragedy. They all tie to together to tell the story of some sort of impending apocalypse. Tells the story of a royal droid named S.A.M., who is searching for her best friend, and heir to the throne. Along the way, she’s joined by an old maintenance droid and a fugitive. Mythical creatures fleeing their war-torn homeland have gathered in in a neo-Victorian city, and tensions are simmering between citizens and the growing immigrant population. The fantasy noir follows the investigation of a string of unsolved murders that are eating away at whatever uneasy peace still exists. Set against the politically tumultuous and sexually charged court of Russian empress Catherine the Great. She wielded supreme power throughout Russia for nearly half of the 18th century; strong-minded, independent, brilliantly intelligent and sexually liberated, she was the definition of the modern woman. The story of a how a family of caretakers who live and work in Central Park end up saving the park — and basically the world. Horza, a rogue agent tasked by the Idirans with the impossible mission of recovering a missing Culture ‘Mind,’ an artificial intelligence many thousands of times smarter than any human—something that could hold the key to wiping out the Culture altogether. Based on Iain M. Banks’ novel. A rag-tag crew of bounty hunters on the run from their pasts as they hunt down the solar system’s most dangerous criminals. They’ll even save the world…for the right price. A live-action adaptation of the cult Japanese animated series. A re-imagining of the Arthurian legend, told through the eyes of Nimue, a teenage heroine with a mysterious gift who is destined to become the powerful (and tragic) Lady of the Lake. After her mother’s death, she finds an unexpected partner in Arthur, a young mercenary, in a quest to find Merlin and deliver an ancient sword. Over the course of her journey, Nimue will become a symbol of courage and rebellion against the terrifying Red Paladins, and their complicit King Uther. In this prequel to the fantasy classic, three young Gelflings inspire a rebellion against the cruel emperor when they discover a horrifying secret. This dark comedy will follow a 17-year-old high school outcast who goes on a mission to find his missing girlfriend in post-apocalyptic Glendale, CA. Based on Brian Ralph’s graphic novel. Epic and intimate sci-fi fantasy drama revolving around a world’s battle against a monstrous, oppressive force. Anthology series a group of ordinary people who stumble onto a puzzle hiding just behind the veil of everyday life. They will come to find that the mystery winds far deeper than they ever imagined. Set in London in the near future, it centers on the British family of Lawrence Hatfield, the man who invented an omnipresent technology called the Feed. Implanted into nearly everyone’s brain, it enables people to share information, emotions and memories instantly. But when things start to go wrong and users become murderous, the family is driven apart as they struggle to control the monster they have unleashed. Explores what would have happened if the global space race had never ended. Previously untitled Ronald D Moore production. An adaptation of Isaac Asimov’s science fiction trilogy about a mathematician named Hari Seldon, who developed a concept called psychohistory, which can predict the future on a large scale. When Hari foresees the fall of the Galactic Empire and a following dark age, he creates a Foundation in an attempt to ensure a more favorable outcome for humanity. Gabby Duran constantly feels like she’s living in the shadows of her uber-polished, successful mother and whip-smart younger sister. She finally finds her moment to shine when she inadvertently lands an out-of-this-world job to babysit an unruly group of very important extraterrestrial children who are hiding out on earth with their families, disguised as everyday kids. Anthology collection of Guillermo del Toro’s personally curated stories, described as both equally sophisticated and horrific. An adult animated series said to be loosely inspired by the current comics, where Harley has cut ties with the Joker and is causing trouble in Gotham City alongside her BFF Poison Ivy and other well known DC Comics characters. A follow-up to The Haunting of Hill House, the new season will feature a new house and new family. Based on the Henry James story ‘Turn of the Screw’. Centres on three generations of Vietnamese Australian families touched by the effects of war. When a powerful amulet is broken on the eve of the Hungry Ghost Festival in Melbourne, a vengeful spirit is unleashed, bringing the dead with him. About a teenage girl, who is the first of a new generation of humans to be raised by Mother, a robot designed to repopulate the earth after the extinction of humankind. But the pair’s unique relationship is threatened when an injured stranger arrives with news that calls into question everything Daughter has been told about the outside world and her Mother’s intentions. Based on a story by Grant Sputore and Michael Lloyd Green. A teen navigates the complexities of high school, family and her sexuality while dealing with new superpowers. Based on Charles Forsman’s graphic novel. When ten people wake up on a treacherous island with no memory of who they are or how they got there, they set off on a trek to try to get back home. They soon discover this world is not as it seems. Faced with the island’s extreme psychological and physical challenges, they must rise to their better selves — or die as their worst ones. Cassie Bishop can see and communicate with the dead, helping them with their unresolved problems, whether she likes it or not. When her longtime friend Det. Tom Hackett and his new partner, former FBI Agent Damien Asante, need help solving a darkly puzzling murder, Cassie agrees to use her abilities. Despite her reluctance, she may have found a way to keep her demons at bay, all while solving some of the city’s most challenging cases. Supernatural drama follows a group of Arab teenagers whose lives are disrupted when a spiritual figure appears in front of them in the ancient city of Petra. They must try and stop Jinn from destroying the world. Follows the world’s first generation of superheroes who received their powers in the 1930s. Now, in present day, they are the revered elder guard, but their superpowered children struggle to live up to the legendary feats of their parents. Based on Mark Millar’s stories. A darkly comedic and contemporary reimagining of Greek mythology, exploring themes of gender politics, power, and life in the underworld. The Last Kids On Earth (Netflix). A man who’s burned out on life and love undergoes a mysterious treatment, only to find that he’s been replaced by a better version of himself. After the murder of their father, the Locke family moves into the Keyhouse family estate, which is home to a bevy of secrets and magic. Based on the comics by Joe Hill. A group of friends obsessed with horror films and monster makeup live in a fantastic dreamworld version of modern day Mexico City. Follows 25-year-old Atticus Black, who joins up with his friend Letitia “Leti” Dandridge and his Uncle George to embark on a road trip across 1950s Jim Crow America to find his missing father. They must survive and overcome both the racist terrors of white America and the malevolent spirits that could be ripped from a Lovecraft paperback. Based on the book by Matt Ruff. Set after the fall of the Empire and before the emergence of the First Order. The series follows the travails of a lone gunfighter in the outer reaches of the galaxy far from the authority of the New Republic. Chronicle of the modern world’s reaction to a man who first appears in the Middle East, creating a groundswell of followers around him claiming he is the Messiah. Is he sent from God or is he a dangerous fraud bent on dismantling the world’s geopolitical order? The story unfolds from multiple points of view. Follows Lois Lane and Lex Luthor as they investigate the world of fringe science and expose the city’s dark and bizarre secrets. Set in an alternate, present-day America where witches ended their persecution 300 years ago by cutting a deal with the U.S. government to fight for their country. The series follows three young women from basic training in combat magic into terrifying and thrilling early deployment. In this world, the traditional roles of gender and power are flipped with women on the front lines, the fight looming and terrorist threats that are strikingly familiar to our world, but with supernatural tactics and weapons. A gang of Victorian women find themselves with unusual abilities, relentless enemies and a mission that might change the world. Follows globetrotting monster hunters Fred and Deloris Allen who, after the death of Fred’s father, return to their hometown in upstate New York with their teenage children Geoff and Viv. As the family adjusts, Fred and Deloris must hide their identities as members of a secret organization, and our heroes quickly discover that their new small-town setting isn’t as idyllic as it seems. Based on the IDW comic by Steve Niles. Set in a world where a DNA test can find your perfect partner – the one person you’re genetically predisposed to fall passionately in love with. Based on the novel by John Marrs. Set in 1938 Los Angeles, the series will explore the conflict between characters connected to the deity Santa Muerte and others allied with the Devil. A Batman prequel series set in 1960's London and based around Alfred Pennyworth in his pre-butlering days when he was a secret service military hero and set up his own security company. Focuses on two androids tasked with raising human children on a mysterious, virgin planet. As the colony of humans divides over religious differences, the androids learn controlling the beliefs of humans is a treacherous, difficult job. Nicole Reese raises her son Dion after the death of her husband Mark. The normal dramas of raising a son as a single mom are amplified when Dion starts to manifest several magical, superhero-like abilities. Nicole must now keep her son’s gifts secret with the help of Mark’s best friend Pat and protect Dion from antagonists out to exploit him while figuring out the origin of his abilities. Based on Dennis Liu’s short film and comic book. The story of seventeen year old Blue Sargent who becomes involved with a group of four privileged private school boys on a quest to find a source of mythical and mysterious power hidden deep in rural Virginia. The closer they get to taking control of their destiny, the more threatening their journey becomes - both physically and emotionally, as Blue discovers she’s fated to kill one of the boys. Based on Maggie Stiefvater’s novels. Where do we go when we die? What’s waiting for us on the other side? Eighty-year old Bonnie Black finds out when she passes away in a Manhattan hospital and opens her eyes in the world of Adystria, a magical land of monsters and dragons where good and evil are waging an eternal war. Reborn in the prime of her life, she finds all her old friends and loved ones waiting… except the husband who died before her. Armed with a sword and partnered with her late father, she sets off through this battle-torn landscape on a quest to find out where he is. Based on the comic series by Mark Millar and Greg Capullo. Based on the movie franchise, the series will further explore the inner workings of the Umbrella Corporation and the new world order resulting from the T-virus outbreak. Set in a world ravaged by ecological devastation, savage winds, and shifting dunes. At its center is a family who makes their way in this world as sand divers: the elite few who can travel deep beneath the desert floor to retrieve mysterious and valuable relics lost to the dust. Adrift in the wake of their father’s disappearance years ago, they rely on skill and each other to endure this ruthless environment where otherwise good people lie, sabotage, and kill in order to survive. An epic, world-building drama set in a a future when the human race has lost the sense of sight, and society has had to find new ways to interact, to build, to hunt, to survive. All of that is challenged when a set of twins with sight is born. A 10-episode, half-hour psychological thriller by M. Knight Shyamalan. In a world cleaved in two by a massive barrier of perpetual darkness, where unnatural creatures feast on human flesh, a young soldier uncovers a power that might finally unite her country. But as she struggles to hone her power, dangerous forces plot against her. Thugs, thieves, assassins and saints are at war now, and it will take more than magic to survive. Based on Leigh Bardgo’s books ‘Shadow and Bone’ and ‘Six Of Crows’. Over a school break, five teenagers at an isolated school in Northern Thailand find themselves haunted by the ghosts of their pasts, only to discover they are threatened by a much more terrifying mystery. The story follows Malachi Constant, the richest man in 22nd-century America. He possesses extraordinary luck which he attributes to divine favor and has used to build upon his father’s fortune. He becomes the center point of a journey that takes him from Earth to Mars in preparation for an interplanetary war, to Mercury with another Martian survivor of that war, back to Earth to be pilloried as a sign of Man’s displeasure with his arrogance, and finally to Titan where he again meets the man ostensibly responsible for the turn of events that have befallen him. Based on Kurt Vonnegut’s novel. Set seven years after the world has become a frozen wasteland and the remnants of humanity inhabit a gigantic, perpetually moving train that circles the globe, the program questions class warfare, social injustice and the politics of survival. Based on Bong Joon-ho’s 2013 movie. A group of teenagers are mysteriously transported to a facsimile of their wealthy New England town, left without any trace of their parents. As they struggle to figure out what has happened to them and how to get home, they must establish order and form alliances if they want to survive. A workplace comedy centered around the people tasked with creating a sixth branch of the armed services… Space Force. A group of five teenagers are inadvertently drawn into an unearthly reality they cannot comprehend and that ties back to the same part of their town in 1908. Once confronted by increasingly bizarre and grim events, the group will reach an unfathomable conclusion: someone is bringing back the dead and those spirits will want vengeance for the mistakes done in the past. Nora is a young Berlin woman who wakes from a coma without any memory of her previous life after taking a mysterious drug. As she sets out to discover what happened to her, she begins to unravel a conspiracy of aliens who are using a synthetic drug to infiltrate humans to use as host bodies. The more truth Nora uncovers, the more of her own dark secret is revealed: She is the key to the invasion she is fighting. Follows high school sophomore Courtney Whitmore as she inspires an unlikely group of young heroes to stop the villains of the past. Explores the town and people who live above “The Loop,” a machine built to unlock and explore the mysteries of the universe – making things possible that were previously relegated only to science fiction. In this fantastical, mysterious town, poignant human tales are told that bare universal emotional experiences while drawing on the intrigue of genre storytelling. Based on the art of Swedish artist Simon Stålenhag. Set in 1953 and follows Alfred and Lucky Emory, who decide to move their family from North Carolina to an all-white Los Angeles neighborhood. The family’s home on a tree-lined, seemingly idyllic street becomes ground zero where malevolent forces both real and supernatural threaten to taunt, ravage and destroy them. The world is stunned when four commuter planes crash within hours of each other on different continents. Facing global panic, officials are under pressure to find the causes. With terrorist attacks and environmental factors ruled out, there doesn’t appear to be a correlation between the crashes, except that in three of the four air disasters a child survivor is found in the wreckage. Based on a trilogy by Sarah Lotz. Another reboot of the late 80's animated series. A reboots of Terry Gilliam’s time-traveling adventure comedy about a young boy who gets caught up with a troupe of thieves as they hop across history to steal treasure, ever on the run from the “supreme being” from whom they’ve stolen their time map. An intricate and magical love story about Clare and Henry, and a marriage with a problem… time travel. Based on the novel by Audrey Niffenegger. Explores the origin story and present-day actions of a CIA black ops program known as Treadstone, a covert operation that uses behavior-modification protocol to turn its agents into nearly unstoppable superhuman assassins. It follows sleeper agents across the globe as they’re mysteriously “awakened” to resume their deadly missions. About a haunted house and a haunted book that stir the imagination of a group of young, wannabe ghost hunters, and a dog, determined to capture the ghost that plagues the notorious home in their neighbourhood in Goa. When a new family and their captivating daughter move into the haunted home, the crew finds it difficult to balance the demands of school and chores with the renewed urgency to capture the neighbourhood ghost before it is too late. Set in a future where humans are able to “upload” themselves into their preferred choice of afterlife. When Nathan meets his early death, he is greeted by the Nora in his version of heaven. As Nathan grows accustomed to life away from his loved ones, the alive Nora struggles to stay afloat working her job alongside Nathan in the afterlife. A group of young adults who meet online are mercilessly hunted by a shadowy Deep State organization after they come into possession of a near-mythical cult underground graphic novel. Within the comic’s pages, they discover the conspiracy theories that actually might be real and they’re forced into the dangerous, unique and ironic position of saving the world. Based on the 2013 UK series. Dr. Luther Swann enters a world of untold horror when a mysterious disease transforms his best friend, Michael Fayne, into a murderous predator who feeds on other humans. As the disease spreads and more people are transformed, society fractures into opposing camps pitting normal people against the growing number of these “vampires.” Swann races against time to understand what’s happening, while Fayne rises to become the powerful underground leader of the vampires. Based on the novel by Jonathan Maberry. Spring breakers are getting murdered in Neptune, thereby decimating the seaside town’s lifeblood tourist industry. When Mars Investigations is hired by the parents of one of the victims to find their son’s killer, Veronica is drawn into an epic mystery that pits the enclave’s wealthy elites — who would rather put an end to the monthlong bacchanalia — against a working class that relies on the cash influx that comes with being the West Coast’s answer to Daytona Beach. A three-part adaptation of H.G. Wells’ famous novel, set at the dawn of the twentieth century. Tells the story of a close future in which the sun is about to expand into a red giant and devour the Earth, prompting mankind to make an audacious attempt to save planet. The multi-generational heroes build ten-thousand stellar engines in an effort to propel Planet Earth out the solar system, in the hope of finding a new celestial home. During the 2,500 year-long journey, a group of daring heroes emerge to defend human civilization from unexpected dangers and new enemies, and to ensure the survival of humanity in this age of the wandering Earth. A Transformers origin story, exploring the expansive universe of Cybertron. A 19 year-old woman wakes up in a morgue with a new lease on life and a divine artifact embedded in her back. She discovers she is now part of an ancient order that has been tasked with fighting demons on Earth, and powerful forces representing both heaven and hell want to find and control her. Based on the Manga novels. Inspired by the “City Watch” subset Sir Terry Pratchett’s Discworld novels, it follows misfit cops who fight to save a ramshackle city of normalized wrongness, from both the past and future in a perilous quest. It features City Watch Captain Sam Vimes, the last scion of nobility Lady Sybil Ramkin, the naïve but heroic Carrot, the mysterious Angua and the ingenious non-binary forensics expert Cheery. The dark satirical and dystopian take on the superhero genre is set in an alternate history in the year 1985 at the height of the Cold War between the U.S. and Soviet Union. It revolves around a group of mostly retired American superheroes who investigate the murder of one of their own and in the process uncover a conspiracy that could change the course of history as we know it. When a meteor collides with the moon, the Earth is ravaged by catastrophic natural disasters. A small percentage of the population is relocated to an alternate world – the New World – and given three lifetimes to rebuild humanity. With the New World in dire straits, twin siblings, Noah and Evelyn, must navigate through three lifetimes to find William and Siena, who bare the other half of their branded keys. The keys, when connected, open a doorway to Earth, a year before the meteor hits, enabling them to warn mankind. Cain, a man cursed with immortality, hunts them down to stop them. Set in a sprawling, epic world where magic exists but only women can use it, the story follows Moiraine, a member of the shadowy and influential all-female organization called the Aes Sedai, as she embarks on a dangerous, world-spanning journey with five young men and women. Moiraine believes one of them might be the reincarnation of an incredibly powerful individual, whom prophecies say will either save humanity or destroy it. Geralt of Rivia, a solitary monster hunter, struggles to find his place in a world where people often prove more wicked than beasts. But when destiny hurtles him toward a powerful sorceress, and a young princess with a dangerous secret, the three must learn to navigate the increasingly volatile Continent together. Based on Andrzej Sapkowski’s book series. A 12-year-old girl who rediscovers a fantastical theme park she dreamed up in her youth and finds that it’s a real, living place in need of repair … and defense. Based on the movie coming on on March 15th. Victorian Detective Inspector Rabbitt, a hardened, seen-it-all booze-hound who’s seen it all, and his hapless, new by-the-books partner, the chief of police’s lewd but insightful adoptive daughter who becomes the country’s first female officer. Together, the trio must fight crime while rubbing shoulders with street gangs, crooked politicians, Bulgarian princes, spiritualists, music hall stars and the Elephant Man.